It has been suggested that this article be merged into Mackinac Island. (Discuss) Proposed since January 2019. This article is about a city in Michigan. For the island of the same name, see Mackinac Island. Mackinac Island (/ˈmækɪnɔː/ MAK-in-aw) is a city in Mackinac County in the U.S. state of Michigan. In the 2010 census, the city had a permanent population of 492, although there are thousands of seasonal workers and tourists during the summer months. An important fur trading center from the eighteenth century, with a predominately French-speaking population of French Canadians and Métis, after the War of 1812, it gained more Anglo-American residents. 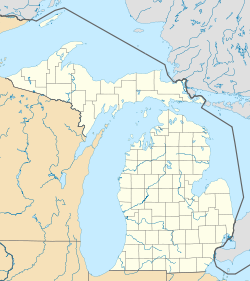 From 1818 until 1882 the city was the county seat of the former Michilimackinac County, which was later organized as Mackinac County with St. Ignace designated as the county seat. The city includes all of Mackinac Island and the unpopulated Round Island, which is federally owned and part of Hiawatha National Forest. The city limits include all of Mackinac Island State Park, which area makes up 80% of Mackinac Island; it is governed by the Mackinac Island State Park Commission. The city is served by the Mackinac Island Public School. A unique local ordinance prohibits the use of any motor vehicles on the island. The most common means of travel are foot, bicycle, or horseback. Certain enumerated exceptions include emergency vehicles, electric wheelchairs for those with disabilities, snowmobiles in winter, and golf carts for on-course use only. Mackinac Island is home to the famed Grand Hotel. The 1980 movie Somewhere in Time was filmed here, and the city made an exception to allow the production company to use motorized vehicles on the island. Mackinac Island is also noted for its many fudge shops on the island. The island has a very large industry making fudge in a traditional manner, creating large portions on cold marble slabs. The many varieties are a tourist draw and common gift throughout Michigan. Harrisonville, also referred to as "the village", is a neighborhood of the city just past the Grand Hotel and up a hill. Hubbard's Annex is a summer cottage subdivision and historical district west of the harbor platted in 1882 by Gurdon Saltonstall Hubbard. The plans included a public park referred to as the Commons and a community building lot for the Eating House. Francis B. Stockbridge purchased a cottage on the bluff top in 1882, where the Dziabis cottage is now located. Andrew Blackbird was the son of an Ottawa chief and served as an official interpreter for the U.S. government in the late 19th century. According to his 1887 history of the indigenous peoples of Michigan, the people of Mackinac Island had been a small independent tribe known as Mi-shi-ne-macki naw-go. They became affiliated with the larger tribe of Ottawa from Ottawa Island (now Manitoulin Island) situated north of Lake Huron. One winter the Mi-shi-ne-macki naw-go on Mackinac were nearly annihilated by the Seneca, a western nation of the Iroquois Confederacy, then based in present-day New York. Two natives escaped by hiding in one of the natural caves at the island. To commemorate this tribe, the Ottawa and Chippewa (Ojibwe) named the island as Mi-shi-ne-macki-nong, also known as Michilimackinac by the 18th century. In 1654 Jesuit missionaries recorded French traders at the island, who were with a large party of Huron and Ottawa heading to Three Rivers. Another trader was said to have made a canoe voyage to the island in 1665. The French colonists continued in the fur trade, which became extremely lucrative; they operated out of Montreal and established posts on Mi-shi-ne-macki-nong and throughout the Great Lakes area. After the French ceded their territory in North America to the British in 1763 following defeat in the Seven Years' War, the British established Fort St. Joseph and an installation on what was known as Michilimackinac. During the American Revolutionary War, they vacated the latter. The Americans established a garrison on what they called Mackinac Island by 1782, commanded by Captain Daniel Robertson; he had command until his death in 1787. In 1796 as a result of Jay's Treaty, the island officially became part of the United States and the Northwest Territory. In the early 1800s Mackinac Island had a permanent population of about 250. Although it was part of the United States, most of the residents were of French-Canadian and Métis ancestry, based on its colonial history, and French was the predominant language. The fur trade was the dominant feature of the economy. Native American languages, particularly Ojibwe and Odawa, and dialects were spoken by some residents. In the summer trading season, the population could reach 4,000, attracting agents and Native Americans from the interior. After the War of 1812, the United States prohibited British fur traders from operating in US territory, cutting off some of the relations between Canadians and Native Americans on the US side. Some fur trading families divided their operations with posts on each side of the border. The noted French writer Alexis de Tocqueville visited Mackinac Island in July 1831 on his tour of the United States. He wrote about its unique population with its strong French and Native American influence. Under American rule, Michilimackinac (the island and adjacent areas) had a justice of the peace, supervisor of roads, and two military captains until the borough was formed. The island's people made a request through Indian Agent William Henry Puthuff on February 2, 1817 that a borough be established on the island and for building a jailhouse. In response on March 15, 1817, Michigan Territory Secretary William Woodbridge issued a proclamation forming the Township of Michilimackinac giving the location's distance from Detroit, the territorial capital. The governor and judges passed an act on April 6, 1817 forming the Borough of Michilimackinac. The borough organizational meeting was held in the Indian Council House, a build that would current be in Marquette Park, presided over by Puthuff on Monday, July 7, 1817. At this meeting, the residents selected the following officers, a warden, two burgesses, a clerk, a marshal and a treasurer. Puthuff was select as warden, the chief official similar to a mayor. The American Fur Company was formed on Main Street, now Market Street. With the 1818 formation of Michilimackinac County by Territorial Governor Lewis Cass, the borough was named the county seat. The Borough form was later replace with that of a village. Waren Puthuff was authorized by borough act to build a wharf at the end of Cross Street, currently Astor Street. This wharf is the longest lasting wharf of the island's and became known as the coal dock. In the late 19th century, Mackinac Island became a popular summer resort destination for travelers from major cities such as Chicago and later Detroit, as well as more distant ones. The Grand Hotel was built as a luxury venue. The seasonal peak of population in the summer, made up of thousands of tourists and service workers, continues to follow the cycle of the fur trade. As then, it is a time of festivities and entertainment. In 1860, the August Pond vs. The People court case was held in the county courthouse clarifying the self-defense legal principle which lead to the phrase “a man’s home is his castle.” Hubbard's Annex was platted on the former Ambrose Davenport farm west of the harbor in 1882 by Gurdon Saltonstall Hubbard. The county seat was move from the municipality in 1882 to St. Ignace. Mackinac Island community was incorporated as a city in 1899. The Michigan Legislature created the City of Mackinac Island in 1899 via act 437 as a special charter city from the Township of Holmes and Village of Mackinac. At that time, all of nearby Round Island was included in the corporate limits, for reasons not clear today. According to the United States Census Bureau, the city has a total area of 18.84 square miles (48.80 km2), of which 4.35 square miles (11.27 km2) is land and 14.49 square miles (37.53 km2) is water. The City of Mackinac Island not only exists on the island of the same name, but also takes in the entirety of nearby Round Island, situated in the Straits of Mackinac immediately to the south. Round Island is currently uninhabited and is owned by the U.S. Forest Service in its entirety, and is managed as part of the Hiawatha National Forest. While all of Mackinac Island, the landform, is located within the corporate limits of the City of Mackinac Island, today 82 percent of the island's landmass is owned by the State of Michigan and managed by the Mackinac Island State Park Commission (MISPC). The City has direct jurisdiction over only 18 percent of the island. The City and the Commission work together on the many issues affecting both the City and the State Park, such as the longtime ban on most motorized vehicles on the island. To get to the island, one can take one of many ferries across Lake Huron. The city of Mackinac Island is one of only seven municipalities in the state of Michigan to consist entirely of islands, including Grosse Ile Township, Drummond Township, Bois Blanc Township, St. James Township, Peaine Township, and Sugar Island Township. As of the census of 2010, there were 492 people, 240 households, and 128 families residing in the city. The population density was 113.1 inhabitants per square mile (43.7/km2). There were 1,002 housing units at an average density of 230.3 per square mile (88.9/km2). The racial makeup of the city was 73.8% White, 1.2% African American, 18.1% Native American, 0.6% Asian, 0.2% Pacific Islander, 0.2% from other races, and 5.9% from two or more races. Hispanic or Latino of any race were 2.2% of the population. There were 240 households of which 22.5% had children under the age of 18 living with them, 39.2% were married couples living together, 7.5% had a female householder with no husband present, 6.7% had a male householder with no wife present, and 46.7% were non-families. 37.5% of all households were made up of individuals and 9.6% had someone living alone who was 65 years of age or older. The average household size was 2.05 and the average family size was 2.69. The median age in the city was 42.5 years. 17.7% of residents were under the age of 18; 7.6% were between the ages of 18 and 24; 27.4% were from 25 to 44; 33.9% were from 45 to 64; and 13.4% were 65 years of age or older. The gender makeup of the city was 52.8% male and 47.2% female. As of the census of 2000, there were 523 people, 252 households, and 143 families residing in the city. The population density was 119.8 people per square mile (46.2/km²). There were 565 housing units at an average density of 129.4 per square mile (49.9/km²). The racial makeup of the city was 75.72% White, 18.36% Native American, 0.38% Asian, 0.19% from other races, and 5.35% from two or more races. Hispanic or Latino of any race were 0.57% of the population. There were 252 households out of which 23.4% had children under the age of 18 living with them, 44.4% were married couples living together, 9.5% had a female householder with no husband present, and 42.9% were non-families. 36.1% of all households were made up of individuals and 9.5% had someone living alone who was 65 years of age or older. The average household size was 2.08 and the average family size was 2.69. In the city, the population was spread out with 18.0% under the age of 18, 6.5% from 18 to 24, 34.4% from 25 to 44, 28.9% from 45 to 64, and 12.2% who were 65 years of age or older. The median age was 41 years. For every 100 females, there were 109.2 males. For every 100 females age 18 and over, there were 106.3 males. The median income for a household in the city was $36,964, and the median income for a family was $50,536. Males had a median income of $39,219 versus $25,313 for females. The per capita income for the city was $27,965. About 1.4% of families and 3.5% of the population were below the poverty line, including 5.1% of those under age 18 and none of those age 65 or over. The city has a council with six members and a mayor. The mayor is elected annually.Margaret Doud was appointed to fill a vacancy on the council in 1974. In 1975, she ran for mayor and won. Doud has continually won re-election to the office since then. The island is served by the Mackinac Island Public School. In addition to the permanent residences, there is dormitory-style housing throughout the city for the seasonal employees of the tourist industry, generally provided by the local businesses. Mackinac Island is the destination of both the annual Chicago Yacht Club Race to Mackinac, run by the Chicago Yacht Club, and the annual Port Huron to Mackinac Boat Race, sponsored by the Bayview Yacht Club of Detroit. There are many family friendly activities to partake in while you are visiting the island. A very popular activity is biking. There are many small shops and boutiques too such as Artists market, Canvas & Paddle, Mackinac Outfitters, and Mackinac Wheels. You can stay at the Grand Hotel and go swimming, golfing or have brunch. Fort Mackinac is a popular family attraction. ^ a b "American FactFinder". United States Census Bureau. Retrieved November 25, 2012. ^ a b "The 18 tiniest cities in Michigan". Flint Journal. December 4, 2016. p. 16. Retrieved December 5, 2016. ^ a b Straus, Frank (July 14, 2007). "A Look at History: Hubbard's Annex Is Historic District Within Mackinac Island". Mackinac Island Town Crier. Retrieved February 7, 2018. ^ a b Blackbird, Andrew J. (1887). History of the Ottawa and Chippewa Indians of Michigan: Earliest Possible Known History of Mackinac Island. Ypsilanti, MI: Ypsilantian Job Printing House. pp. 19–20. OCLC 29210477 – via Google Books. ^ Bailey, John R. (1896). Mackinac Formerly Michilimackinac (2nd Neosho ed.). Lansing, MI: Darius D. Thorp & Son. OL 22885767M – via Archive.org. ^ Porter, Phil; Swain, Susan (August 7, 1997). "Tocqueville in Mackinac Island". Tocqueville (Video). C-SPAN. ^ a b c d e f g Lien, Cathryn (July 14, 2017). "City of Mackinac Island Reaches 200th Anniversary". Mackinac Island Town Crier. Archived from the original on February 8, 2018. Retrieved February 7, 2018. ^ a b Lien, Cathryn (July 14, 2017). "A History of the Borough of Michilimackinac, City of Mackinac". Mackinac Island Town Crier. Retrieved February 7, 2018. ^ Public and Local Acts of the Legislature of the State of Michigan. State of Michigan. 1847. pp. 68, 69, 119–124. Retrieved February 7, 2018. ^ Michigan Legislature (1899). "Local Act 437: An Act to Vacate the Township of Holmes and Village of Mackinac, in Mackinac County, State of Michigan, and to Incorporate the City of Mackinac Island in Said Mackinac County". Local Acts of the Legislature of the State of Michigan Passed at the Regular Session of 1899 with an Appendix. Lansing, MI: Robert Smith Printing Company. pp. 377–438. OCLC 679994901 – via Library of Michigan. ^ "US Gazetteer files 2010". United States Census Bureau. Archived from the original on January 24, 2012. Retrieved November 25, 2012. ^ "Census of Population and Housing". United States Census Bureau. Retrieved June 4, 2015. ^ Ellison, Garret (January 9, 2013). "Impassioned preservation debate comes to a head on Mackinac Island with historic districts vote". MLive.com. Retrieved February 7, 2018. 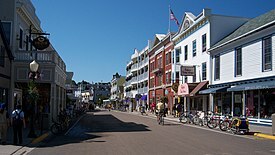 Wikimedia Commons has media related to Mackinac Island, Michigan. Wikivoyage has a travel guide for Mackinac Island.